*Standard LP in a gatefold sleeve, single black LP with chapbook, plus digital download card* "When considering Massachusetts' Speedy Ortiz, that line from Virginia Woolf comes to mind. Not only for the obvious echoes to DIY, a form and function that's characterized the band's nascency, but in the proto-feminist undertones driving much of their sophomore album, Foil Deer. "I'm not bossy, I'm the boss," Sadie Dupuis sings on "Raising the Skate," invoking in spirit one half of the Carter-Knowles clan and echoing the other's wordplay. And wordplay makes sense, considering Dupuis-the band's songwriter, guitarist, and frontwoman-spent the band's first few years teaching writing at UMass Amherst. She's drawn to the dense complexity of Pynchon, the dreamlike geometry of Bolaño, the confounded yearning of Plath-all attributes you could easily apply to the band's 2013 debut Major Arcana, which fans and press alike have invested with a sense of purpose and merit uncommon in contemporary guitar rock. The group, including Mike Falcone on drums, Darl Ferm on bass, and new addition Devin McKnight of Grass is Green on guitar, have spent the last year on an almost endless cross-continental touring jag, tagging along with the likes of The Breeders, Stephen Malkmus & the Jicks, and Thurston Moore. That shift into full-time musicianship brought with it an attendant reordering of priorities when it came to songwriting, and the band members' lives in general. They would get the damn flowers themselves. Dupuis wrote much of Foil Deer at her mother's home in the Connecticut woods, where the songwriter imposed a self-regulated exile and physical cleansing of sorts, finding that many of the songs came to her while running or swimming alone. "I gave up wasting mental energy on people who didn't have my back," she says. "Listening to our old records, I get the sense I was putting myself in horrible situations just to write sad songs. This music isn't coming from a dark place, and without slipping into self-empowerment jargon, it feels stronger." Many of the songs deal with a similar sense of starting over, editing out the unnecessary drama. 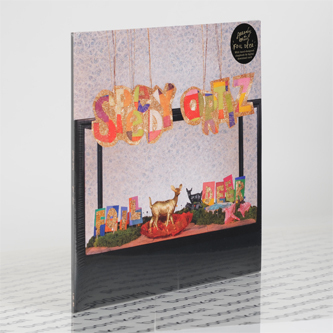 "Boys be sensitive and girls be, be aggressive," she sings on "Mister Difficult.” And while their debut album was recorded on the fly, Speedy Ortiz spent almost a month in the studio on Foil Deer. Falcone's drums are taut, mechanistic; Ferm's bass ranges from the aggressive rattle of an AmRep classic to smoother, hip-hop inspired lines. McKnight, meanwhile, lends spacier, textural riffs to complement Dupuis' wiry, melody-driven guitar style. "The demos for our songs have always had tons of small details and production experimentation, but we never had any money to pay for more than a couple days in the studio, so the songs came out very live-sounding and guitar heavy," Dupuis says. It was recorded and mixed at Brooklyn's Rare Book Room with Nicolas Vernhes (Silver Jews, Enon, Deerhunter), with the record mastered by Emily Lazar (Sia, Haim, Beauty Pill), lending a more polished sound and a pop sensibility that will stand out to existing fans and new converts alike. For all the lyrical complexity and guitar-based excursions Speedy Ortiz have built their reputation on to this point, Foil Deer has a sense of light-footed fun. What's the point of doing things yourself if you're not going to enjoy the trip?"